The items I sent away to Twice. A lot more stuff would fit in one bag. 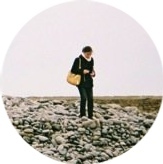 Edited 6/29 - I realized I never updated this entry to reflect that I've now gone through the Thredup selling experience twice. My thoughts on that can be found here. One side effect of all the decluttering is, naturally, that I end with a lot of stuff to get rid off. A lot of things should be thrown away. I donate a lot of the clothes. I've gifted some of the nicer items to my sister. However, after years of not shopping as thoughtfully as I could, I've accumulated many fairly nice pieces of clothing in like-new condition that just don't suit me and wouldn't interest my sister or any of my friends. After dabbling with Ebay to sell some old electronics, I found that I just didn't have the energy to try to sell my clothes that way. Incidentally, I don't think Kondo's book would actually advocate spending time on trying to resell things. Her philosophy is more about keeping only the things that bring you happiness in your life and putting aside the rest. I imagine that expending additional effort or potential stress on reselling items that no longer bring joy would not be particularly consistent with her approach. If I was already working at my full-time job when I decluttered, I probably would have donated everything. It wouldn't have been worth spending the time to research my options. That being said, both Twice and Thredup make it very easy to sell. They'll send a free laundry-bag-sized thick plastic bag with a prepaid shipping label to you upon request (both selling services are currently free, but I believe Thredup normally charges), you drop it off at your local UPS or FedEx (the label on the bag will let you know where to go) or even arrange for pickup (Thredup) and they'll get back to you with an offer for your items. Both will donate the items that they don't accept for resale. Note that the $63.12 offer is only if I choose store credit, the payout was actually $50.50 in cash. I can't do a full comparison of the two services yet because I am still waiting on my offer from Thredup, but I can report that I was fairly satisfied with my selling experience on Twice. One of the primary advantages of Twice is that they are much faster. I actually sent my Thredup selling bag almost a week before my Twice bag, but because Twice is a smaller site, they get back to you very quick. It only took about 3 business days to get the bag and from the day I mailed it, it took about a week and a half to get my offer. Every step of Thredup so far has been slower. Based purely off the "letter of the law" when it comes to both sites' quality guidelines, Twice likely has slightly less stringent guidelines for the items they'll accept. 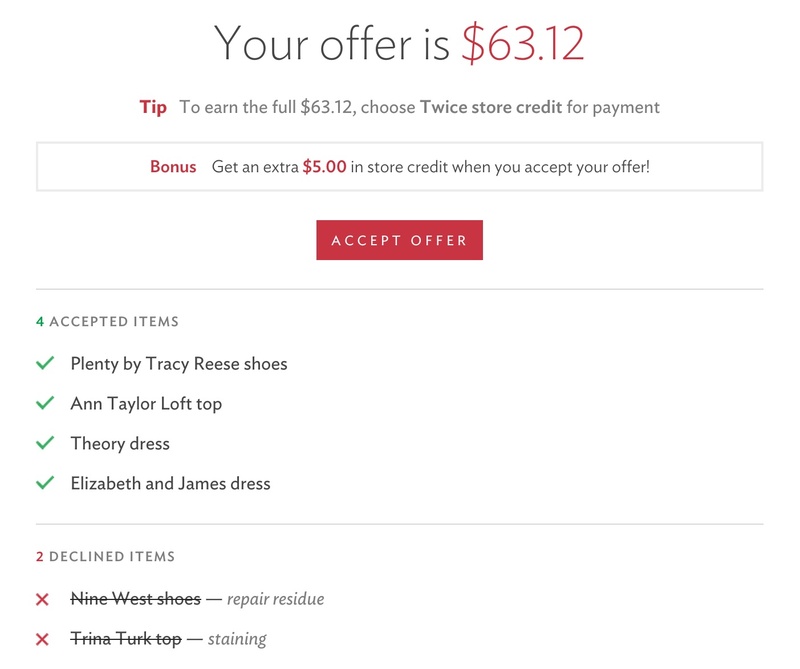 Where Thredup explicitly requests new or like new items, Twice says that items "you would give to a friend" are alright. Anecdotal evidence from my college alum Facebook group suggests that Twice generally accepts a larger percentage of items than Thredup. This is not to say that they don't do quality control. Everything I sent was in what I considered like-new condition and you can see that they rejected two items. I had never worn either item and only tried them on at home or at the store. Relatedly, I am a bit surprised that they accepted the Loft cardigan. While I never wore it, there was a tiny defect with the sweater that arose from inconsistent quality with the manufacturing. Twice offers Venmo as an option for cashing out, which allows for an instantaneous payout.To my knowledge, Thredup only offers Paypal, which has a longer processing time. If you reject your offer, its cheaper to get your items back. It costs $4.95 to get your entire bag returned from Twice. It is a pity that they won't just send back the items that they rejected. However, when compared to Thredup's $12.99 Return Assurance shipping fee, its still a much better deal. They accept fewer brands. Regardless of my experience with Thredup, I'll probably end up sending them another bag because Thredup accepts H&M, while Twice does not. They accept fewer types of accessories. I believe Twice accepts only bags and shoes while Thredup accepts things like scarves and belts. Their quality control is maybe a bit more arbitrary than I would like. I think my experience shows that they are careful and scrutinize items fairly closely, but it does mystify me that they accepted the Loft cardigan, but not the Tracy Reese silk top, which looked new to me. It is fairly likely, however, that Thredup is even more stringent.